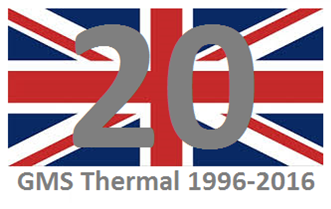 February of this year marks the 20th anniversary of GMS Thermal Products Limited. Looking back over the years, GMS have worked on a variety of large projects all over the world. From providing packages for the London 2012 Olympics to providing cylinders for the Integrated Workers Hospital in Qatar. Other countries which GMS have shipped to include; Finland, Portugal, Cyprus, Abu Dhabi, Sri Lanka, Italy, Singapore, Kazakhstan, Hong Kong and across the whole of the UK. Our employees have also travelled around the world, with engineers visiting Kazakhstan and Gibraltar, and our design team visiting the ASHRAE Conference in New York and Florida. Lauren Ashmore, one of our design engineers, also visited the Vocational Training Council in Hong Kong to present her paper on "Possible Methods of Potable Water Production & Distribution for Domestic Use in the UAE". September 2015 saw important changes with regards to the European Eco-Design and Energy Labelling of hot water storage vessels. GMS have lead the way in that all of our storage vessel heat losses are now compliant to the 2017 standard with all standard vessels rated C or above. This month also saw GMS Thermal join the #MadeInTameside Campaign. The campaign aims to; showcase engineering and manufacturing companies within the Tameside area, celebrate business successes and explore the benefits for the local area and people. Finally, GMS would like to say a big thank you to all of our customers and suppliers who have supported us over the years. A special thanks goes to all of our employees at GMS who make it all happen!